HSA can be used to implement traditional GPGPU programming languages like OpenCL™ as well as new emerging standards like Microsoft C++AMP. HSA also supports a broad set of languages ( System Programming, Application Programming, DSL) such as Python and C/C++ that broadens access of HSA programming to all levels of programmers. HSAIL is HSA’s Intermediate Language that is the assembly language of HSA. It abstracts the complexities of compute devices in heterogeneous systems. A compiler outputs HSAIL in a binary object format. 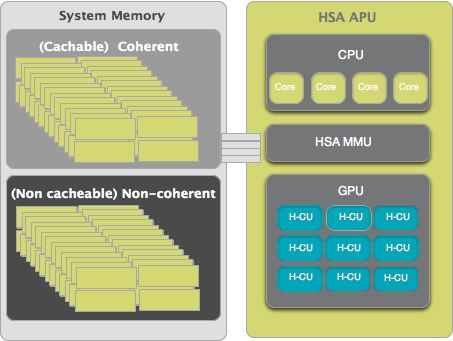 An HSA Finalizer then translates HSAIL to the native machine code of the computing unit( GPU, DSP, ISP, etc.). Tools Programmers can leverage the HSA Run-time to build custom tools at different layers in the stack. 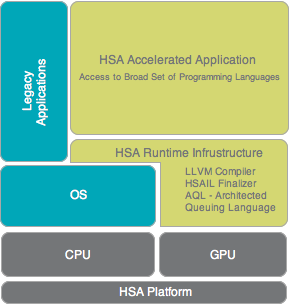 HSAIL + AQL for full custom compilers ( GCC, etc) and Virtual Machines ( JVM, etc), as well as leverage the HSA-enabled LLVM compiler stack, which generates HSAIL binaries. Tools for compiling OpenCL kernels into HSAIL. An approachable runtime layer(“OKRA”) that minimizes the time required to get started with HSA. The HSA Foundation assists companies that engage in the development of tools, libraries and SDKs that support systems programming, application programming and domain specific programming.